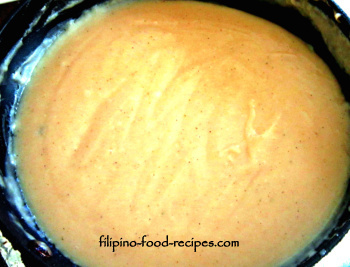 This is a basic chicken gravy, perfect dip for fried chicken, breaded pork chop or just to top a creamy mashed potato. The recipe starts with a basic roux, or cooking the flour in butter, rather than making a flour and water slurry that is added in the end. Equal amounts of flour and butter is cooked in low heat until slightly dark. The final taste and shade of the sauce depends on how light or dark the roux was cooked - the nuttiness of the cooked flour comes out if the roux was cooked properly. We prefer making a roux than making a flour-water slurry so the gravy will not have a paste-like consistency . The broth could be that of chicken, beef or vegetable -- if it is going to be served with fried chicken, steak(yes, we eat our steak with gravy), or crispy-fried vegetables, respectively. 1 Melt the butter in a saucepan and add the flour. 2 Cook together until medium to slightly dark brown, about 5-8 minutes on low heat. 3 Add the dried thyme, ground pepper, Knorr chicken cube and water. 4 Bring to a boil while mixing continuously. Taste and season with salt if needed. 6 Serve as a dip for fried chicken, breaded porkchop or mashed potato. You could use chicken or beef broth instead of the Knorr cube, just season with salt. If margarine(which is salty) is all you have, just pull back on the salt to suit your taste. I strain the gravy to make sure it's nice and smooth and to remove the thyme leaves -- not necessary, I just like my gravy smooth. Replace the chicken with beef cube or beef broth to make a beef or steak gravy. Why not go home and make your own -- and you can drown yourself with all the gravy you want.